Oahu Winter Outlaw Series Event 5 Checkpoints. Here are the checkpoints for the mauka to makai race. Its about 6 miles depending what route you take. Hope to see everyone there! Due to some tragic happenings on roads on the side of the island we were supposed to race, and general safety concerns... we have decided to change the venue to a different spot for the next race. It will now be a race from the valleys to the ocean. We will be meeting at Manoa Park and racing to Bike Factory , with a few check points in between. THIS WILL BE THE 2x EVENT FOR THE SERIES , so i hope to see everyone there. THIS EVENT IS RAIN OR SHINE! WHEN Jan 1. NEW YEARS DAY. THE SCORCHER. - Write Up and Photos! The second race of the 2010 Oahu Winter Outlaw Series was The Scorcher Invitational. 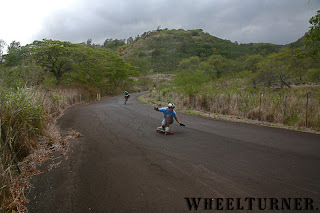 This race course is called Hawaii’s gnarliest race course yet for a reason… crack filled, steep, gravel covered, closed, hairpins, rocks, holes…just to name a few. A total of 16 racers were invited, but 10 racers made it on time to register ready to race. After taking about an hour of practice runs the heats were chosen and the race is ready to start. Racing was a 1 on 1 format, which seemed to be raising butterflies in lots of racers bellies… Can you say KAVA! Round 1 is Cory T. vs Kaimana P, Nikko K. vs Kdub, MackDizz vs KJ, Ben F vs Miles L. along with Jeff K. and Will R. getting to skip to Round 2 for being the first to sign up. Round 1 is full of fast falls and riders flying off the road at all directions. After intense racing making it to Round 2 is Cory, Miles, Jeff, Nikko, Will and KJ. Its round 2 and the heats are Cory vs Miles, Jeff vs Nikko and Will vs KJ. The racers really seem to have the hang of the course now. This round had way less people going off the road, and WAY closer racing. The 3 racers who battled it out past this round are Miles, Nikko and KJ…How are the heats going to work now? Now is where the surprise bonus round came up, the three racers eliminated were now given the chance to compete in a 3 man heat…The winner moves on to the Semi Finals. In the survival round it is Cory vs Jeff vs Will. The pack of three are very tight in the first two hairpins but spread out a little bit with a minor fall in the steep straight. Flying into the bottom right turn was Cory with a BIG gap between the other racers. Just as he’s throwing his predrift he takes a spill and dislocates his shoulder, but with cheers from all of the racers, takes off back down the hill to take the heat. When walking back up the hill Cory decided to give his spot to second place due to his shoulder, so Jeff moves on. The semis are set, Miles vs Nikko and KJ vs Jeff (reg vs goofy in both heats) First down the hill was Miles and Nikko, and these two were CHARGING. Nikko is in the lead as they approach the bottom two hairpins. At the fastest ( and bumpiest) part of the hill Nikko drops a foot and Miles matches him with a predrift close behind. They approach the last hairpin leading to the finish when Miles makes a last minute swoop for the win and a spot in the finals. The second heat of the semis was another close battle and coming out victorious was Jeff taking the second spot in the finals. Finals are Miles L. vs Jeff “ CJ KANG”…goofy vs goofy and in the consi is Nikko K. vs KJ N. First is a fall filled consis, riders taking something like 2 falls a person in 1 run! And taking it was KJ. In the finals it was all STYLE for MILES! Taking it flawlessly with a shaka and smile on his face. Couldn’t have been a cleaner run on the GNAR. Riders first through fourth won some cash money, plus schwag from Jati, Sector 9, Dirtytree, Rip City Skate, Black Velvet Slide pucks and System Media. Lots of other riders showed up through out the day to support and cant wait to race the course next year! 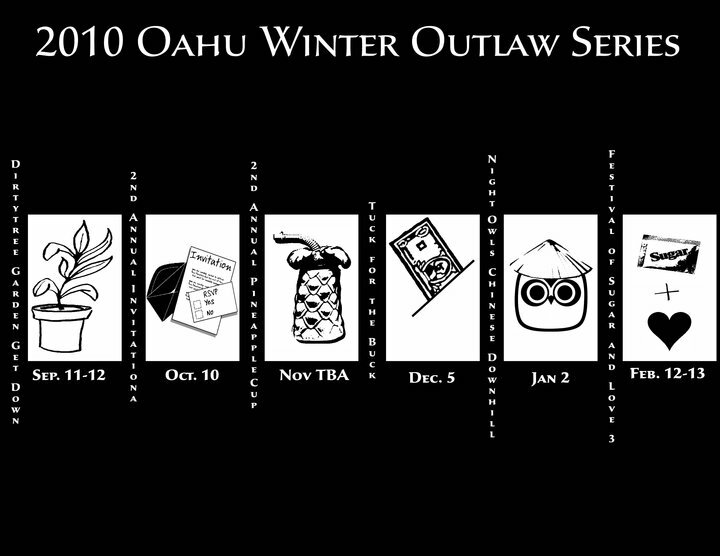 Thanks to everyone who came out and see you at the rest of the Oahu winter outlaw series events! Full write up, photos and videos coming soon! Entry - $5 CHEAP come out, race and have fun! Winner take all in both devisions. 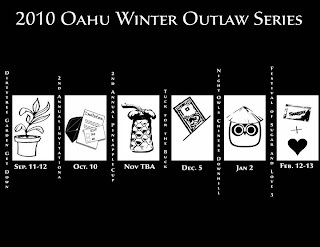 This is the 4th event in the OahuWinterOutlawSeries, and so far we've had some awesome events. The Sidewalk Surfing Showdown will be held on Dec 5 at the ravine, probably the most forgiving course out of the series venues. Just because its forgiving doesn't mean it wont be a fun one. For those who have skated some of the past ravine gatherings, this one will be a little different. It will be a solo racer time trial with a few twists from the normal race course. Come out for some good times and great outlaw racing. 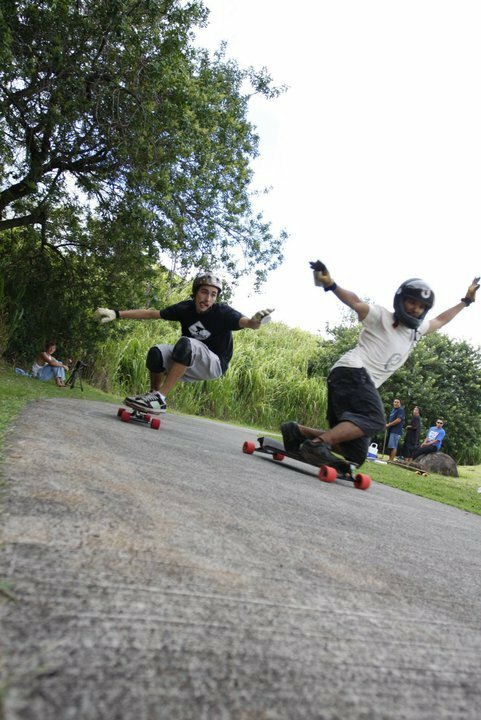 Oahu Winter Outlaw Series Event 1 - Dirtytree Garden Get Down. The Dirtytree Garden Get Down on September 10,11 and 12 held on the east side of the island was the first of six events in the Oahu Winter Outlaw series. Racers had a weekend of camping, bbqing, avoiding boy scouts, surviving golf courses, slopestyle jams, oh and not to mention a race. The course was a fun and forgiving dip to 3 back to back turns, allowing riders to give it their all. After 4 rounds of racing we got down to our final heat and taking the first event was Nikko K. Followed by Mackennzie Y, Kaimana P, and KJ N. shortly behind. That night we all had a bbq and awards donated by Dirtytree, Jati, Sector 9, System Media, Hi Supply, Step Hi, BVSP, Rip City Skate and more. Just as everyone is breaking down camp on the third day of the event they are reminded the slide jam is about to start. Lots of slides, slams, and sweating off beer went down and the champ of it all was Darryl Freeman. Points will be given to all racers to go towards the Oahu winter Outlaw Series over all points. Next event…THE SCORCHER. MATT KINZLE swoops event 3 FLAWLESSLY. Visitor Matt K. killed it yesterday taking 1st at the OahuWinterOutlawSeriesEvent3 -ThePineappleCup. This is the first year we will be connecting events to make a series and it should be a blast. There will be 6 races starting in September and going till February. Points will be taken at each event for a overall point winners who will get stoked out on prizes from sponsors. There will be a double point event so you will have the option to skip one event and still keep up in points. All of the events are outlaw so remember to roll with control and at your own risk. Sep. 11-12. @ Eastside Green Zone. - 2nd Annual Pineapple Cup. Nov. 14. Pineapple Cup Road. Dec. 5. @ SECRET LOCATION. Jan 2. @ ............ 12am start. - Festival of Sugar and Love 3.